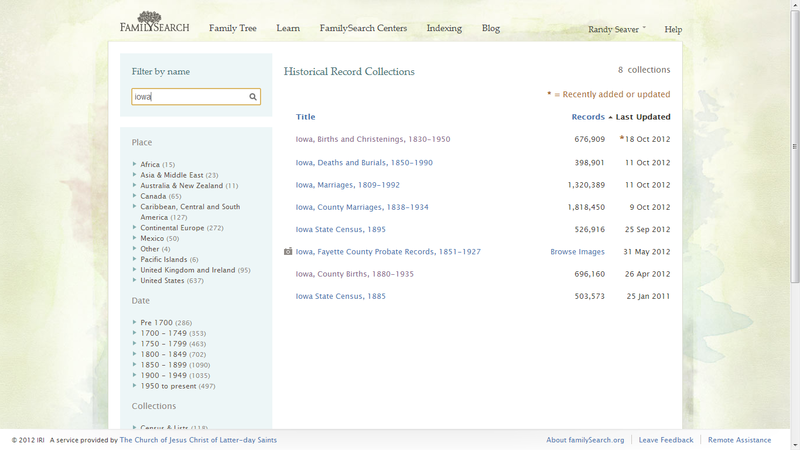 This week's Tuesday's Tip is: Look for Iowa ancestral records in the FamilySearch Record Collections. 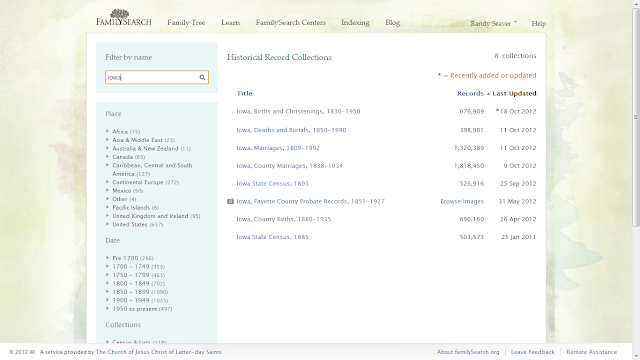 There are 8 collections for Iowa records in the FamilySearch Record Collections (put "Iowa" in the search box in the upper left-hand cvorner at https://www.familysearch.org/search/collection/list). Not all of these collections are complete - the record collection description will usually describe the percentage complete and the counties included. For instance, the Iowa County Marriages, 1838-1934 collection is 86% complete, and the page lists the counties included. These records are all from state indexes or records that were microfilmed over the years by the LDS Family History Library and recently digitized by FamilySearch and indexed by volunteers for researchers to use for free. I use records like these to enrich my family tree - I have Seaver, Carringer, and Vaux families in my database with Iowa vital records events. One lesson here is to check the collection list periodically for updates. The screen shown above is in Date Updated order - 5 of the 8 collections have been updated since late September 2012.